Puppies were born from Danger and Belle and they are ready for their new homes now. Tennessee residents subject to state sales tax. 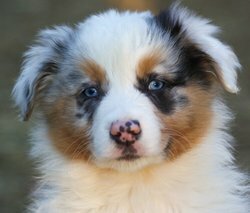 A $200 deposit will reserve the puppy of your choice until pick up, delivery or shipping. If using Paypal or credit card, 5% additional fee will be added. No puppies reserved or held without a deposit. All reservations are based on deposits in the order that they are received. All deposits are non-refundable, but if a situation arises and you are not able to purchase the puppy at the time, the deposit can be applied to any future puppy that is available. Deposits can be applied to any puppy marked available at any time. Previous customers receive $100 off any puppy any time in the future. All puppies are sent to their new homes with current vaccinations, dewormed, vet checked, health record and registration papers. Shipping is $375 to most destinations within the continental US (weather permitting). Meeting for delivery is also available within 200 miles for a $125 fee. Door to door transport is also available and must be arranged well in advance. Microchipping is available, cost is $50 and includes microchip, tag for collar and lifetime registration. Many of the microchip companies charge an annual fee to maintain your contact information, but this one does not, no other fees due ever. If you would like your puppy microchipped, please let us know and we can get it done before they go home. This litter is AKC registered and puppies will be expected to mature in the 40-55lb. range. With a pedigree packed full of champions, they have the potential to excel in the show ring, agility, obedience and any other venue. Raised with children, they will also make wonderful family companions. Photos cannot be used without permission.